Topic: Have I figured out Roth conversion? Re: Have I figured out Roth conversion? The very first article I read on this site was about eating cat food to save money on food expenses: https://rootofgood.com/confessions-frugal-millionaire/. The publication date - April 1 - should have been the first clue. Put another way, you are paying $5k every year for absolutely no benefit. Roth IRA conversion - Bogleheads may be of interest. 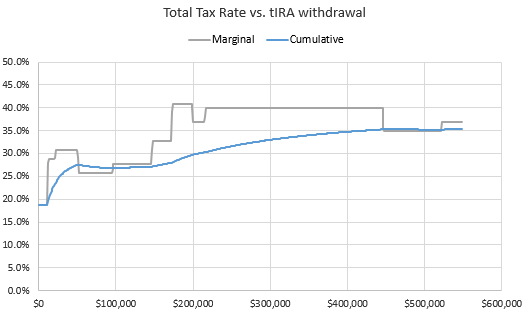 You don't need to wait until 59.5, although if you are still working (at any age) it may not be beneficial due to the high marginal rate you are likely to pay. Agreed - that's what spreadsheets are for. ...but there must be some number in between that is "just right". Sure hope not, because we did something very much like that in 2017. ...they have a mix of state pensions and SS. If they also might benefit from some traditional to Roth conversions before SS and/or RMDs begin, that could move an SS-only answer to a later benefit start. Fortunately some of the comments corrected various errors. Unfortunately some of the comments contained other errors. t = tax rate applied to the income from that investment. Was there a reason given for less than 100% rolled over? Did you also have $20K on line 15a of https://www.irs.gov/pub/irs-prior/f1040--2017.pdf, and $0 on 15b? But if one can reasonably get from 40 times expenses to 50 times expenses in 3 or 4 years, and as a result have a better chance of surviving all but the most catastrophic of situations, isn't that trade off worth it? Of course it's only an opinion, not a fact, whichever way one responds. The "but what if something worse happens?" game is never-ending. Different people have different risk tolerances (not to mention perceptions of what constitutes risk), so there will never be unanimity here. But then, at year 6, everything plummets and now you only have half of what you started with. Things stay glum for 5 years. At year 10, things get even worse, and everything loses another 50% of its value, so now you have 1/4th of what you started with. Is that worse than the worst of the past? My understanding is that Fidelity has excellent index funds and has very good customer service. I have to make Estimated Tax Payments for 2019 (first time) and am already behind a couple of days! Any chance that either you or your spouse can increase withholding instead of doing estimated?